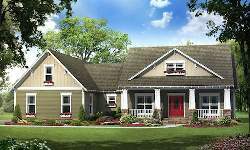 Craftsman style houses reflect the thinking of English designers. A Craftsman house features a low-pitched, gabled roof (often hipped) with a wide overhang and exposed roof rafters. Its porches are either full or partial width, with tapered columns or pedestals that extend to the ground level. The appeal of the Craftsman home style can be found in its rustic appearance which embraces the hands-on craftsmanship of the turn-of-the-Century Arts and Crafts movement. The Craftsman house plans in this collection stay true to these ideals, offering variations of the Craftsman style home from simple one-story home plans to elaborate two-story estate floor plans. Lifestyle Features: great room, covered rear porch, volume/vaulted ceiling peninsula/eating bar, covered front porch, storage area, split bedrooms, walk-in closet, side-entry garage, finished attic bonus room, nook / breakfast area, suited for corner lot, den/office/computer, open floor plan. • The living area is 2,118 square feet. • Basement: 2118 square feet of unfinished basement. • Attic over the garage: Bonus 335 square feet of finished attic area with more than 78 inch headroom. • Garage: 714 square feet of attached garage under the main building roof, same finish as the home interior. • Porch not under the main roof: 426 square feet of porch with open ceiling, shed roof. Using a 10 corner shape for the foundation on the Cost to Build Calculator for building in the Spartanburg, SC area, the cost estimating software came up with a total cost to build of $367,126,. By deducting the General Contractor’s Markup of $41,913 from $367,126 I came up with $325,213 for an owner/builder. That’s an approximate cost of $151 per sq. ft.
Keep in mind, a one level home usually costs more per sq. ft. to build than a 2 story home of the same square footage. You may want to read more on this on my article on How to Read House Plans. The cost to build does not include land, land development costs, impact fees, or other local fees, if any.